The hottest material around for gardens and home décor also is one with a rich and ancient history: bamboo. Long used in both Eastern and Western cultures, it looks graceful and brings a touch of nature to any space. 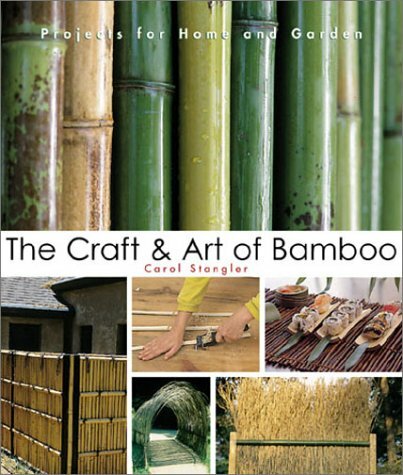 From harvesting to assembling projects, this photo-filled introduction to bamboo fundamentals gives advice on preparing and buying, tips on drying and weathering, hints on preventing and dealing with insect damage, and instructions for cleaning the bamboo. Follow the directions on cutting, splitting, joining, attaching, bending, flattening, finishing, and preserving. Construct lovely fences, gates, railings, screens, furnishings, accessories, and more for landscape, garden, and home. Picture a curved bamboo handrail along a walkway, a low trellis for climbing plants, a charming porch swing, a simple Japanese flower container, even an outdoor shower stall. Lush photography and abundant illustrations make this easy to use...and a treat for the eyes.